With technology evolving at a rapid pace, the availability and ease of earning an online MDiv has never been more achievable than it is today. Online education offers today's student greater flexibility in how they go about procuring their degree. For some, a traditional residential program may more desirable. The reality, though, is that for many a residential program would interfere with their day-to-day lives and would make earning their MDiv impossible. Online education offers the convenience of working from home, thus allowing the student to continue in their current vocation without the need to relocate. The Master of Divinity degree, more commonly referred to as MDiv, is a professional degree for those seeking ordination to vocational ministry or interested in pursuing doctoral studies. The MDiv focuses on four aspects of learning: religious heritage, cultural context, personal and spiritual formation, and ministerial and public leadership. Further, the MDiv also has several different emphases that a student can chose to focus on that fit their vocational as well as educational goals. Some of the more common emphases would include: New Testament, Old Testament, systematic theology, pastoral care, preaching, and church history. In comparison to other master degrees that focus on religion, the MDiv is usually far more exhaustive in its scope. It consists of an average of 80 to 100 semester hours, which is roughly 26-33 classes. Most MDiv degrees can be completed in three to four years if enrolled in classes full time. We have researched numerous programs to come up with this list: The Top 20 Online MDiv Programs. The schools ranked in this list represent the best fully online MDiv programs available to students. We have chosen these programs based on a number different factors. We looked at the overall academic quality of the program, faculty strength and publications, reputation, and any applicable national rankings. Fuller Theological Seminary ranks #1 on The 20 Best Online Master of Divinity (MDiv) Degree Programs! Situated in Pasadena, California, Fuller Theological Seminary is arguably one of the most recognized and respected institutions of theological training in the world. Fuller was founded in 1947 by Charles E. Fuller and Harold J. Ockenga to train men and women to to be intellectually sound and culturally attuned. Since its establishment over 70 years ago, the school has grown significantly, adding a number of other schools under the Fuller umbrella: School of Psychology, School of Intercultural Studies, and the Center for Advanced Theological Studies. Fuller also has a number of different campuses outside of Pasadena, as well as Online programs. Fuller Theological Seminary is accredited by the Western Association of Schools and Colleges and the Association of Theological Schools. Fuller's Master of Divinity is consists of 120 quarter units. All of the course work for the MDiv is done online, with four one-week visits to the main campus required as part of the MDiv degree. The student can choose between a number of emphases like Asian American Contexts, Christian Ethics, islamic Studies, Biblical Languages, and more. Classes that the student will take include Pastoral Care, Engaging Culture, Systematic Theology, Church History, and various electives. Fuller's MDiv will prepare the student for agile, theologically informed leadership—whether he or she pursues an occupation in vocational ministry, business, nonprofit work, the arts, or academia. Fuller Theological Seminary has one of the finest faculties for any theological institution. Their faculty includes world-renowned experts who have published seminal works in their respected fields. On top of this, they likewise have one of the best research facilities for theological and related studies, consisting of seven locations. The Southern Baptist Theological Seminary ranks #2 on The 20 Best Online Master of Divinity (MDiv) Degree Programs! The Southern Baptist Theological Seminary, or Southern Seminary, as it is more commonly referred to, first opened its doors to students in 1859. After spending the first eighteen years in South Carolina, the seminary moved to its current home in Louisville, Kentucky. Southern Seminary is both the oldest and largest seminary in the Southern Baptist Convention, with an annual enrollment of more than 5,000 students each year. The seminary is accredited by the Southern Association of Colleges and Schools Commission on Colleges and by the Commission on Accrediting of the Association of Theological Schools in the United States and Canada. Southern Seminary's Master of Divinity is a fully online degree consisting of 88 units. Classes are offered in six, eight-week terms throughout the year. This condensed format allows the student to take classes more frequently while focusing on fewer subjects at a time, with most students finishing their MDiv in three to three-and-half years. The student can narrow down his or her focus of study and select from variety of concentrations like Biblical and Theological Studies, Biblical Counseling, Pastoral Studies, Urban Missions, Islamic Studies, to name a few. Some of the core curriculum classes that the student can expect to take during his or her time at Southern Seminary include Systematic Theology, Greek and Hebrew, Hermeneutics, Introduction to Church History, Worldview and Apologetics, Pastoral Ministry, and Discipleship and Family Ministry. Southern Seminary also has one of the finest faculties of any seminary in the United States, and have consistently been on the cutting edge of biblical and theological and scholarship. Many of their faculty have seen their own publications adopted at other major seminary and Bible colleges throughout the country. The seminary also publishes quarterly its own journal, The Journal of Theology. Denver Seminary ranks #3 on The 20 Best Online Master of Divinity (MDiv) Degree Programs! Founded in 1950 by the Conservative Baptist Association of America, Denver Seminary today is an interdenominational graduate-level school of theology serving students from throughout the entire evangelical community. Denver Seminary is a graduate-level school of theology, accredited by the Association of Theological Schools, the Higher Learning Commission, and the Council for Accreditation of Counseling and Related Education Programs. The seminary offers several MA, MDiv, ThM, and DMin degrees with numerous specialized concentrations and has campuses in Denver, Washington DC, West Texas, and online. Denver Seminary's 78-credit-hour Master of Divinity degree is designed to be completed fully online and can be finished in three years. The MDiv program at Denver is offered as part of their Next Generation Online Learning and is engineered to keep you fully engaged in learning while living in your community. Classes are rooted in the academic rigor and mentored learning that has been the hallmark of Denver Seminary since its inception. Some of the courses that the student can expect to take include, Greek and Hebrew, Survey of Christian Doctrine, Apologetics and Ethics, Church History, Intro to Preaching, and Ministry Leadership. Denver Seminary's faculty consist of committed professors who are rigorous in their fields—publishing prolifically and speaking internationally—and who are committed to mentoring students outside of the classroom. The seminary also publishes online the Denver Journal, a review journal that aims to include reviews of significant, recent books and published media relating to the major fields of biblical and theological studies. Southeastern Baptist Theological Seminary ranks #4 on The 20 Best Online Master of Divinity (MDiv) Degree Programs! Located in Wake Forest, North Carolina, Southeastern Baptist Theological Seminary is one of the seminaries under the auspices of the Southern Baptist Convention. Founded in 1950 to accommodate students on the east coast, Southeastern Baptist Theological Seminary has seen its enrollment grow to over 3,000 students each year. The seminary is accredited by Southern Association of Colleges and Schools Commission on Colleges and the Commission on Accrediting of The Association of Theological Schools. Southeastern Baptist Theological Seminary's Master of Divinity degree is an 81-hour, completely online program designed for vocational and academic service. Students receive academic and practical training in areas such as Biblical Studies, Christian history, missions, theology and applied ministry. Classes follow the same semester calendar as on-campus classes—approximately 16 weeks for fall and spring and 11 weeks for summer. The average time it takes for a student to complete his or her degree is around three or four years. While at Southeastern, the student will enroll in a variety of vocational and academic courses like Old and New Testament Interpretation, Greek and Hebrew, Christian Theology, Introduction to Christian Ethics, Christian Philosophy, Church History, Baptist History, and Historical Theology. The Southeastern Baptist Theological Seminary faculty is committed to the excellence of biblical and theological education, with a few their faculty publishing textbooks and reference works that are used throughout seminaries in the United States. Southeastern also publishes a biannual journal entitled the Southeastern Theological Review. Portland Seminary ranks #5 on The 20 Best Online Master of Divinity (MDiv) Degree Programs! Formerly known as George Fox Evangelical Seminary, Portland Seminary was founded in 1947. It operates as a university-based graduate school, offering a variety of postgraduate degree programs in local and online delivery formats that the student may pursue part time or full time. Portland Seminary is accredited by the Commission on Accrediting of the Association of Theological Schools, and the Northwest Commission on Colleges and Universities certifies its programs. This dual accreditation is maintained through George Fox University and assures students of the highest academic and professional standards. Portland Seminary's Master of Divinity is a 78 credit-hour-program designed for the student who works full time. While enrolled in the seminary's distance programs, the student is paired with other classmates to form a vibrant learning community, traveling through the degree program together as a close-knit cohort. While most of the MDiv is completed online, there are times when the student will be required to travel to the seminary's main campus for intensive face-to-face time with his or her cohort. These intensives are held three times during the school year: October, February, and May or early June. Common classes at Portland Seminary include Old Testament and New Testament Introduction, Engaging the Old Testament, Interpreting the New Testament, Introducing Biblical Hebrew and Greek, and more. Portland Seminary's MDiv is a robust academic experience that does not require the student leaving his or her current vocation. The seminary's goal is to create an environment where the student is educated, trained, and mentored for leadership and service. Southwestern Baptist Theological Seminary ranks #6 on The 20 Best Online Master of Divinity (MDiv) Degree Programs! One of the largest seminaries in the world, Southwestern Baptist Theological Seminary has seen its more than 44,000 students graduate to serve in vocational and academic posts throughout the world. The seminary was chartered in 1908 by B. H. Carroll as an outgrowth of the theological department at Baylor University. In 1910, it relocated to its current home in Fort Worth, Texas. Southwestern is accredited by the Southern Association of Colleges and Schools Commission on College as well as the Association of Theological Schools. Southwestern Baptist Theological Seminary's Master of Divinity is a fully accredited, fully-online MDiv, giving the student access to the seminary's world-class faculty and the ability to start or complete his or her degree while continuing in their current vocational context. An MDiv at Southwestern consists of 91 credit hours that help prepare the student for a vocational or academic career. While Southwestern, the student receives training in classical theological disciplines such as Old and New Testament Introduction, Church History and Historical theology, Systematic Theology, Ethics and Philosophy; as well as applied disciplines such as Pastoral Ministry, Homiletics, Evangelism, and Missions. In addition, the student may use elective hours to pursue concentrations in any school at Southwestern in accordance with their vocational goals and academic interests. Southwestern has a diverse faculty, with several of their professors regularly involved in publishing. Another strength of the seminary is their world-class library facilities, with an estimated holding of over a million volumes. Southwestern also publishes their own biannual journal called the Southwestern Journal of Theology. Moody Bible Institute ranks #7 on The 20 Best Online Master of Divinity (MDiv) Degree Programs! Moody Bible Institute was originally established by D. L. Moody in 1886 as the Chicago Evangelization Society. Eventually they changed their name to Moody Bible Institute, and in 1985 opened the Moody Graduate School and Seminary. In 2011, Moody Graduate School and Seminary became Moody Theological Seminary. Moody Theological Seminary is accredited by the Commission on Accrediting of the Association of Theological Schools. Moody Theological Seminary's 90 credit, fully online Master of Divinity degree includes a distinctive program focus on biblical languages. Courses at Moody follow either an 8-week or 16-week format. Moody's MDiv degree is designed to help the student develop an academic expertise in his or her understanding of the Bible. The core of an MDiv at Moody centers on subjects such like Hebrew and Greek, Hermeneutics, Old and New Testament Literature and Theology, Systematic Christian Theology, Apologetics and World Religions, Church History, and Homiletics. The student also has two internships that are built into the curriculum to help him or her apply what is learned in the classroom and then applying that in vocational real-life settings. The Master of Divinity at Moody Theological Seminary allows the student to take every class when it's most convenient, thus allowing the student to maintain his or her current life, work and vocational commitments. The student will likewise have the opportunity to learn from an outstanding faculty who have made numerous contributions to publications such as the Lexham Bible Dictionary, a commentary on “Second Corinthians” in The Moody Bible Commentary, and The Moody Handbook of Preaching. Liberty University School ranks #8 on The 20 Best Online Master of Divinity (MDiv) Degree Programs! Liberty University School of Divinity began offering graduate level education in 1973, and is currently the home of more than 8,000 residential and online students. The School of Divinity provides the student an excellent postgraduate education that is committed to academic excellence and vocational training. Liberty University is accredited by the Southern Association of Colleges and Schools Commission on Colleges to award associate, bachelor's, master's, specialist, and doctoral degrees. Liberty University's Master of Divinity is a fully online program designed to prepare the student for professional work in vocational ministry as well as para-church organizations. The MDiv program provides an in-depth knowledge of leadership principles and methods, and an academic study of the Bible and theology. Coursework places emphasis on embracing the essential values, knowledge, and skills needed to serve in a variety of vocational roles. An MDiv at Liberty offers specializations in areas like Global Studies, Pastoral Counseling, and Christian Apologetics. One of the benefits of studying at Liberty University School of Divinity is their commitment to partnering with students in the military. The MDiv at Liberty is an excellent option for military students looking to fulfill service requirements as chaplains for certain branches of the armed services. Gateway Seminary ranks #9 on The 20 Best Online Master of Divinity (MDiv) Degree Programs! Upon receiving its California state charter in the summer of 1944, Golden Gate Baptist Theological Seminary officially began offering classes that same fall at its northern California campus, where it remained for the next seventy-two years. In 2016, the seminary changed its name to Gateway Seminary and subsequently relocated to its current home in Los Angeles. The focus of Gateway Seminary is to shape students by promoting personal and vocational growth by means of a rigorous and academic curriculum. Gateway Seminary is a theological school of the Southern Baptist Convention, accredited by the Association of Theological Schools and the Western Association of Schools and Colleges. The Master of Divinity at Gateway Seminary consists of 90 credit hours, all of which are completely online and can be completed in three years. Gateway's MDiv is designed to set students on a trajectory of lifelong personal, intellectual, and professional growth. Every online class is asynchronous to fit your schedule. Old and New Testament Introduction, Greek and Hebrew, Hermeneutics, Christian Ethics, and Christian Theology are just a sample of the classes the student will take while attending Gateway Seminary. Gateway Seminary's Online classes are specifically designed for the online environment. Classes are conceived and executed with the web in mind and not simply face-to-face classes transferred to the web. Each course is developed and taught by experts in their field who hold or are pursuing terminal degrees. Western Seminary ranks #10 on The 20 Best Online Master of Divinity (MDiv) Degree Programs! Originally established as the Portland Baptist Bible Institute in 1925, Western Seminary began offering graduate-level education in 1927. It has since grown and added campuses in northern California and Seattle, Washington. Western's Online Campus has its beginnings in 1981, when it launched an innovative video instruction program that quickly expanded to serve hundreds of students per year. Western Seminary is accredited by the Northwest Commission on Colleges and Universities and by the Commission on Accrediting of the Association of Theological Schools in the United States and Canada. Western Seminary's Master of Divinity is an online, 82 credit hour degree program, with three required visits to their Portland campus. Western's MDiv program equips the student to engage in leadership roles, such as vocational ministry, chaplaincy, and teaching. Western's MDiv also serves to meet ordination requirements for some Christian denominations, while also meeting admission qualifications for doctoral programs that focus on theology. Students will take a variety of courses at Western, consisting Old and New Testament Theology, Greek and Hebrew, Hermeneutics, Transformational Leadership, Homiletics, and Ministerial Ethics. Western Seminary strives to provide the student a thorough education by providing advanced training for strategic vocational and professional roles. New Orleans Baptist Theological Seminary ranks #11 on The 20 Best Online Master of Divinity (MDiv) Degree Programs! Founded in 1917, New Orleans Baptist Theological Seminary offers the student an academic environment, utilizing innovative methods of delivering an academic education. NOBTS blends scholarship, practicality, accessibility, and opportunity to provide the student a thorough and demanding education. New Orleans Baptist Theological Seminary is accredited by the Southern Association of Colleges and Schools Commission on Colleges and by the Commission on Accrediting of the Association of Theological Schools. New Orleans Baptist Theological Seminary's Master of Divinity is an 84-hour online degree. The MDiv at NOBTS will prepare the student to serve in the widest variety of vocational positions and serve as a foundation from which the student can pursue further doctoral studies. While at NOBTS, the student will enroll in classes such as Exploring the Old and New Testament, Greek and Hebrew, Systematic Theology, History of Christianity, and Christian Ethics. New Orleans Baptist Theological Seminary has a strong academic faculty involved in academic publishing and theological research. The seminary is also home to several research centers like the Baptist Center for Theology and Ministry, responsible for publishing the Journal for Baptist Theology and Ministry, and The H. Milton Haggard Center for New Testament Textual Studies, which houses an impressive collection of New Testament Greek manuscripts. Regent University ranks #12 on The 20 Best Online Master of Divinity (MDiv) Degree Programs! Regent University was established in 1997 under the direction of Pat Robertson. Since that first class of 70 students in 1977, Regent has grown exponentially, with an average of over 1,500 students graduating each. Regent University offers degrees from bachelor's through doctoral, all of which can be earned online. Regent is accredited by the Southern Association of Colleges and Schools Commission on Colleges. Regent University offers a number of Master of Divinity degrees. Each of these MDiv tracks are fully online and consist of 72 total credit hours. The MDiv tracks include such emphases as Biblical Studies, Church and Ministry, History of Christianity, Marketplace Ministry, and more. Classes the student can expect to take include Old and New Testament Survey, Early Christianity, Modern Christianity, World Christian Perspectives, World Religions, and Leadership in Church and Ministry. Regent's MDiv is a professional degree designed to prepare the student for full-time vocational ministry, ordination, and ministry licensure. The student will gain a solid foundation in ministerial philosophy and practice through an academic study of the Bible. Practical skills and values are emphasized in practical theology, church leadership, and other related courses. Bethel Seminary of Bethel University ranks #13 on The 20 Best Online Master of Divinity (MDiv) Degree Programs! Bethel University had its birth as a seminary in 1871 in Chicago. Founded by Christian sea captain John Alexis Edgren, the Baptist Union Theological Seminary was established as a means to train Swedish pastors for congregations of Baptist immigrants fleeing persecution by the state church in their Scandinavian homeland. While Bethel relocated several times, it nevertheless remained a part of the University of Chicago's divinity school until in 1914. That year, churches of the Baptist General Conference acquired and moved it permanently to St. Paul, where it joined with a Baptist high school to form Bethel Seminary and Academy. In 1947, its sister school became a 4-year college, and together they were known as Bethel College and Seminary. Bethel Seminary is accredited by the Association of Theological Schools, the Higher Learning Commission, and other accrediting groups depending on program needs. The Master of Divinity at Bethel Seminary can be completed fully online. It consists of a total of 78 credits, which the student can completed in four to five years. Bethel's MDiv will prepare the student for vocational ministry, chaplaincy positions, and for further doctoral studies. Classes the student will take for their MDiv include Old and New Testament Survey, Hermeneutics, Systematic Theology, Church History, and more. Alongside classes in the Center of Biblical and Theological Foundations, Bethel University also offers the student opportunities to take classes in a variety of other disciplines. The student can take classes in Children's and Family Ministry, Christian Thought, Church Planting, and Transformational Leadership. Corban University School of Ministry ranks #14 on The 20 Best Online Master of Divinity (MDiv) Degree Programs! First established in 1935 in Phoenix, Arizona as the Phoenix Bible Institute, the college moved in 1946 to Oakland, California and took the name Western Baptist Bible College, being affiliated with the General Association of Regular Baptist Churches. In the mid-1950s the school moved to El Cerrito, California. In 1969, the college moved to Salem, Oregon, where it operates today, and in 2010 changed its name to Corban University. Corban University is accredited by the Northwest Commission on Colleges and Universities. Corban's Master of Divinity consists of 85 credit hours. The MDiv available entirely online or as a hybrid of online and on-campus classes, allowing the student options to take classes that fit around his or her schedule. You will be able to choose your own program pace and schedule, attending full time to finish in just three years or completing the program at a part-time pace. The MDiv at Corban includes both a Church Ministry track and a Biblical Languages track, allowing flexibility for the student to choose choose courses based on various vocational or academic goals. Sample courses would include Interpreting and Teaching Scripture, Servant Leadership, Worldviews, Church History, Preaching and Theology. 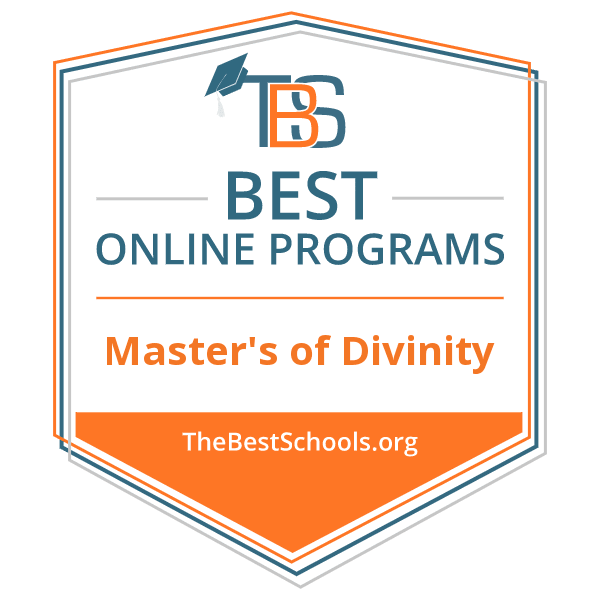 Iliff School of Theology ranks #15 on The 20 Best Online Master of Divinity (MDiv) Degree Programs! Iliff School of Theology was founded in 1892 by Colorado Seminary (now the University of Denver), and named after John Wesley Iliff, who desired to establish a school for training ministers in the territory of Colorado. In 1903, Iliff School of Theology was incorporated as an independent institution, separate from the University of Denver. And in 1910 it became a freestanding school of theology and Methodist seminary. Iliff continues to be on the forefront of graduate theological education. Iliff School of Theology is accredited by Association of Theological Schools in the United States and Canada and the North Central Association of Colleges and Schools-Commission on Institutions of Higher Education. Iliff's School of Theology's Master of Divinity (MDIV) degree is offered through the Journey Program, providing the student the greatest flexibility to earn his or her education necessary to serve in a vocation of ministry, including parish ministry, chaplaincy, not-for-profits, and a variety of other areas. Iliff's MDiv is an online degree (with a required three visits to the Denver Campus), consisting of 120 quarter credits, which can be completed in three years. Some of the classes that the student is required take include Religion, Space, and Place; Pastoral Theology; Identity, Power, and Difference. And Race, Gender and Class. The MDIV also requires an internship and offers concentration in various areas via elective courses. In addition, Iliff's MDIV Program offers you the unique ability to demonstrate your effectiveness to future employers, since you may earn certificates in specific areas of concentration while earning your degree. Asbury Theological Seminary ranks #16 on The 20 Best Online Master of Divinity (MDiv) Degree Programs! Starting with a class of just three students, Henry Clay founded Asbury Theological Seminary, now part of Asbury University, in 1923. From those meager beginnings, Asbury has flourished into one of the most recognized and respected seminaries in the United States. With campuses in Kentucky, Florida, and Online, those original three students have grown to over 10,000 students from all over the world. Asbury Theological Seminary is accredited by the Commission on Colleges of the Southern Association of Colleges and Schools to award masters and doctoral degrees. Asbury is also accredited by the Commission on Accrediting of the Association of Theological Schools in the United States and Canada. Asbury Theological Seminary's Master of Divinity consists of 96 credit hours. Asbury's MDiv is an online degree, in which up to two-thirds of the degree can be completed online via Asbury's convenient Extended Learning program (ExL). Asbury offers the student a number of specialized tracks which he or she can major in. Some of these tracks include Church Planting, Anglican Studies, Intercultural Studies, Christian Leadership, Theological Studies, and more. Within each of these tracks, all students will take a number of core classes like Old Testament and New Testament Introduction, Greek and Hebrew, Basic Christian Doctrine, Christian Ethics, Philosophy of the Christian Religion, World Religions, Contemporary Theology, and more. Alongside Asbury Theological Seminary's strong MDiv programs, the seminary also has a strong doctoral studies degree, with one of the finest faculties supervising PhD students at any theological seminary in the United States. Asbury also publishes two journals through their First Fruits Press: The Asbury Journal and The Journal of Inductive Biblical Studies. Wesley Seminary Indiana Wesleyan University ranks #17 on The 20 Best Online Master of Divinity (MDiv) Degree Programs! Indiana Wesleyan University is an evangelical Christian comprehensive university that is committed to liberal arts and professional education. In 2009, the Board of Trustees of IWU launched the Wesley Seminary, adding thirty new Master of Divinity students to the 170 they already had enrolled in their MA in in Ministry. Since its inception in 2009, Wesley Seminary had grown to over 500 students. Indiana Wesleyan University is accredited by the Higher Learning Commission and is a member of the North Central Association. In December 2008, the HLC extended IWU's accreditation to include the Master of Divinity degree. The Master of Arts in Ministry degree has been accredited since the program's inception. Wesley Seminary is additionally accredited by the Association of Theological Schools. The Master of Divinity at Wesley Seminary IWU is a fully online degree that consists of 75 credit hours. Wesley Seminary's MDiv is an innovative degree, built around vocational ministry in action. At its core are six six-hour "praxis" courses that center around mission, leadership, worship, proclamation, congregational spiritual formation, and congregational relationships. In these courses, the primary assignment each week involves action research in and feedback from a local church. Accordingly, all students have to be connected at least 10 hours a week with a vocational ministry work. The curriculum at Wesley Seminary focuses on three specific areas: Foundational Courses, Praxis Courses, and Spiritual Formation. There are also fifteen credit hour elective courses that a student will be required to completed as well. Some of the classes that the student will take while enrolled for his or her MDiv at Wesley Seminary include Pastor, Church, and Word; Cultural Contexts of Ministry; Global Christian History; Congregational Leadership; Spiritual Formation: Change and Transformation; Spiritual Formation: Self Awareness and Appraisal; Spiritual Formation: Recovery and Deliverance; and more. Clarks Summit University ranks #18 on The 20 Best Online Master of Divinity (MDiv) Degree Programs! Originally founded as Baptist Bible Seminary, Clarks Summit University first opened its doors in New York in 1932. After outgrowing its original home in Johnson City, Clarks Summit moved to its current home in Pennsylvania in 1968. Clarks Summit University is accredited by the Middle States Commission on Higher Education. Middle States is a regional accrediting agency recognized nationally, with all degrees at Clarks Summit approved by the Pennsylvania Department of Education. Clarks Summit University is also accredited since 1968 by the Association for Biblical Higher Education. The online Master of Divinity at Clark's Summit University consists of 48 credits and a required one-year paid internship. Courses for the MDiv at Clarks Summit are offered completely is online. The student at Clarks Summit can choose between a number of different concentrations like Church Education, Church Planting, Military Chaplaincy, Pastoral Counseling, Pastoral Leadership, and more. Some of the classes that the student can expect to take include Greek, Hebrew, theology, Bible, and church leadership with specialty courses and first-hand experience for maximum practicality and excellence in vocational ministry. At Clarks Summit, each of the concentrations are tailored to the interests and vocational ministry focus of the student, all with the help of seasoned senior professors. As mentioned previously, each concentration includes an eighteen credit hour, one-year paid internship, giving you immediate ministry experience. The internship hones the leadership skills of the student in a tangible, sound, and practical teaching environment. Grand Canyon University ranks #19 on The 20 Best Online Master of Divinity (MDiv) Degree Programs! Originally named Grand Canyon College and residing in Prescott, AZ., Grand Canyon University was founded 1949 by the Southern Baptist Convention. Two years later, GCU moved from its original home in Prescott to Phoenix, where it remains today. The turn of the century found the University in dire straits, which eventually led the university to transition out of non-profit status in 2004 and implement new business practices to turn around operations. Grand Canyon embraced a new emphasis on enhancing curriculum and opportunities for working professionals, particularly in nursing and education. Grand Canyon holds regional, college and program-specific accreditations. Grand Canyon is accredited by the Higher Learning Commission. Grand Canyon University offers a Master in Divinity that is fully online. The MDiv consists of 90 credit hours, with the average course lasting around eight weeks. The MDiv at GCU exposes the student to a rigorous academic program of religious inquiry that is theologically rich. The student will study the biblical texts and related religious ideologies from a scholarly perspective, thus allowing the student to gain insight in the areas of theology, Christian ethics, and apologetics. The core classes of the MDiv that the student will be expected to take include Church History, Greek and Hebrew, New Testament Theology, World Religions, and academic study of Old and New Testament books. Other classes that the student can take include Contextualized Church Planting, Anthropological Principles for Cross-Cultural Ministry, Global Christianity, Christian Worldview and Media, and more. Luther Rice College and Seminary ranks #20 on The 20 Best Online Master of Divinity (MDiv) Degree Programs! Luther Rice College and Seminary was founded in Florida in 1962 by Robert Gee Witty. After almost thirty years in Florida, Luther Rice moved to its current home in Metro Atlanta in 1991. Luther Rice College and Seminary is accredited by the Commission on Accreditation of the Association for Biblical Higher Education, to grant certificates and degrees at the Baccalaureate, Master's, and Doctoral levels. Luther Rice College and Seminary is also a member of the Transnational Association of Christian Colleges and Schools. Luther Rice College and Seminary's Master of Divinity program is designed to provide a broad base of knowledge that assists in preparing the student for vocational ministry. Luther Rice's MDiv is a 90 credit hour program that can be completed fully online. The core curriculum includes courses in Church History, Theology, Preaching, Pastoral Ministry, and Counseling.The student can also choose to complete the Master of Divinity program with open electives or with a specialization in Greek and Hebrew. The open electives track allows students to customize their course of study with twenty-four hours of electives to choose from. Students pursuing a specialization in Greek and Hebrew will have the opportunity to study biblical literature while learning Greek and Hebrew.